Essential viewing, and often uncomfortable, not only because it reminds us of a dark time in human history, but because it holds a mirror up to us and challenges us here in the present. Selma tells the story of Martin Luther King’s march from Selma Alabama to Montgomery to campaign for voting rights for black people. Of course, they technically were allowed to vote, but arbitrary practical hindrances were placed in front of them such as poll taxes, and ridiculous tests at the voter registration centre. On top of that, there is the chilling and ever present presence of the FBI, monitoring their every move and the logging of their meetings and telephone conversations. If none of this is sounding familiar to you, then might I be so bold as to suggest that you are part of the problem? Fundamentally, this film is about power, and how those in power abuse it to rule over those who have no power. Power is having a gun, power is holding all the keys, and power is being able to keep secrets while your enemies can’t. What is striking about the civil rights movement is that the powerless manage to make a meaningful challenge to the powerful, and in the end they triumph. The events depicted in the film are based on historical fact, and that is what makes many of them so uncomfortable to sit through. Although not quite as desperately hopeless as the situation of Solom Northrup in 12 Years a Slave, watching innocent people suffer at the hands of some truly reprehensible behaviour left me ill at ease. Ill at ease because I know that this used to be “normal” behaviour in the (all too recent) past, and especially ill at ease because I know that this behaviour hasn’t entirely vanished from the world. The overarching theme of surveillance by the state, punctuated by overlayed typed text of FBI reports after meetings and phone conversations has obvious echoes in the present, in the wake of the Edward Snowden revelations. The observation of Dr King’s interactions with an ostensibly cooperative president LBJ, who would in the very next scene consult with J. Edgar Hoover, who to me is the personification of everything that is wrong with the surveillance state, indicated the massive asymmetry in power that existed between the oppressors and the oppressed. Since this all really happened in real life, I suppose I wouldn’t be giving anything away by saying that after setback after setback, they are eventually able to march all the way to Montgomery from Selma, and demand protection of their right to vote. If it hadn’t happened in real life, I would in my cynical way judge the ending to be poorly-written for being unrealistic. The fact that, despite the odds being stacked against them, they really did have a ‘happy’ ending is perhaps the take-home lesson here. As a film, it is sound. Well written with decent cinematography. 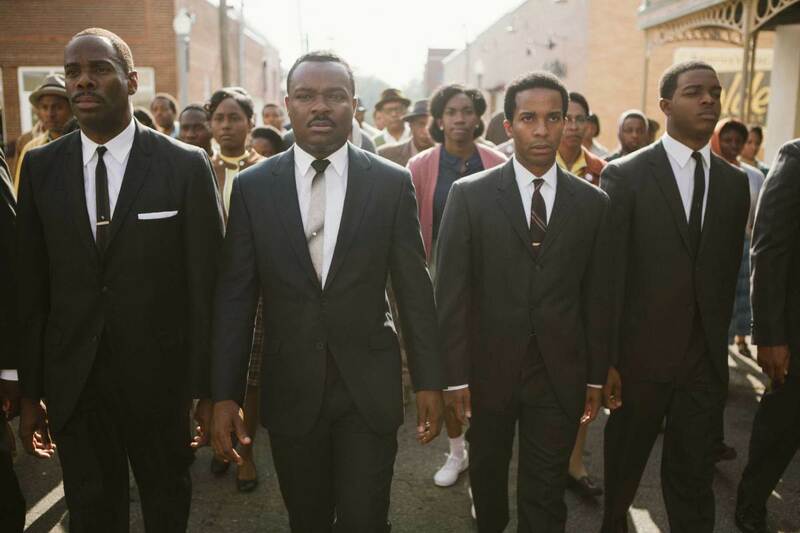 David Oyelowo is the spitting image of Dr King, and there are cameo appearences from Oprah Winfrey and Jed Bartlett. The pacing is perhaps a little bit on the slow side, and those unfamiliar with the history behind the story may struggle to follow, especially in the early minutes. That being said, I was glad for the absence of all the cliché stock photos and “I have a dream” references, and the film really does stand on its own without and of it. Towards the end, real historic footage is spliced in to remind viewers that this really happened. This is probably one of the weaker best picture nominees, but it is still a very good film. It is still a very important film, and I am bitterly disappointed that there are, as yet, no plans for it to be released in theatres Denmark, I can only hope that the oscar nomination gets the attention of film distributors here. (it is not the lowest-grossing film out of all the nominees either, that honour belongs to Whiplash, which IS getting a Danish release). Watch this film, learn a bit of history, and try not to be too disappointed that so little has changed in the 60-odd years since the events depicted.